The Leixen FREE backpack radio bag promo is back! Note: This promotion expired July 31, 2018 and is no longer available. Yes, the Leixen Free backpack bag promo is back for two weeks only and only at Buy Two Way Radios! From now until July 31, 2018 you get a FREE Leixen Camo Back Pack Bag when you buy a Leixen VV-898P or VV-898SP UHF/VHF Dual Band Mobile Backpack Two Way Radio! The Leixen VV-BP-CAMO Back Pack Bag is designed by Leixen for use with the VV-898P and VV-898SP mobile backpack radios. 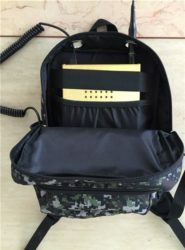 It features a large, interior pocket to hold the radio securely and eyelets on top to allow the antenna and speaker microphone cable outside the bag. It's a great accessory for your Leixen mobile backpack radio and helps protect it from nature while hiking, camping or relaxing outdoors. Simply purchase a minimum of one VV-898P or VV-898SP radio and your free Leixen Back Pack Bag will added to the cart automatically. There is no maximum limit. This offer is valid until July 31, 2018 or while supplies last, which ever comes first. No rain checks. Offer void where prohibited, taxed or restricted by law. This entry was posted in Special Offers, Ham Radios and tagged camo, Leixen, VV-898P, VV-898SP, backpack on July 24, 2018 by Rick.